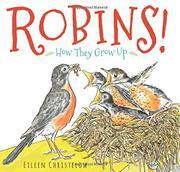 Two young robins (“robin teenagers!”) chattily describe their first spring and fall. Inspired by the appearance of a nest built atop a hoe in her garden shed, Christelow creates a pair of feathered narrators who present their life story—or the first part, at least. That begins in early spring with the arrival of Dad, who stakes out a territory in preparation for the later appearance of Mom. Subsequent nesting, hatching, and fledging occur in due order—with the consumption of “fourteen feet of worms” in the first two weeks alone (“Regurgitated worms! Yum!”). They also lose two sibs to a squirrel and a hawk, practice flying, watch parents and other members of the flock to learn about personal care as well as hazards and food sources, and finally molt and migrate south. In keeping with the informal tone, the author places loosely drawn animal figures in a mix of large single or smaller sequential panels, or sometimes just out on the open page with text enclosed in dialogue balloons. Aside from one poorly placed comment that may leave readers with the impression that Dad fertilized the eggs after they were laid, the natural history is accurate. A closing Q-and-A fills in more detail, including the salient fact that not all robins are migratory.